road. 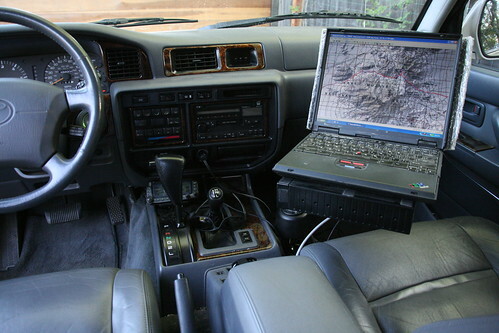 This software is by far the best part of using laptop while traveling on four wheel drive trails. With the laptop’s big screen and all the information in the map makes it so easy to find the names of mountains, mines and other geographic features. From finding old railroad grades, old cemeteries and many other interesting things while traveling. The TOPO! 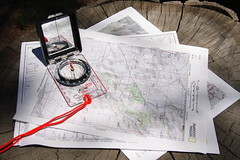 maps are images of the original USGS maps including handwritten notes and other information not found in any other mapping software (that I know of). MS Streets and Trips: The latest version has voice prompts for driving directions (while on paved roads). UI-View: An Amateur Radio mapping, position tracking and messaging application (APRS). With PMapServer7 and Precision Mapping Streets and Traveler. Gpsgate: This application allows multiple programs to share one GPS. I can run MS Streets and Trips, UI-View, VisualGPSXP, Netstumbler and TOPO! all using one GPS with this program. 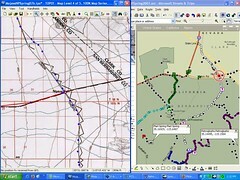 I use the NEMA logging facility to generate tracks from my travels. 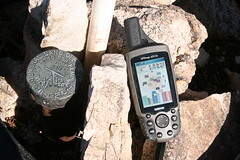 NEMA files are also used for Geotagging travel photos. RAM POD III: A very nice laptop mounting system. I modified it slightly. I didn’t use the little "fingers" to hold down the laptop. They interfered with opening and closing the laptop. I removed them and used Velcro. The laptop arm can be position over the center console so the front passenger seat can be used. iGo auto notebook power adapter. A DC to DC power adaptor for the laptop. This eliminates the need for an AC inverter for the laptop. Ubiquiti SRC: A high power 802.11a/b/g WiFi card used for wireless Internet access. COMET 7.4dBi gain WiFi antenna: 2.4GHz antenna for the Ubiquiti SRC WiFi laptop card. Keyspan USB Serial Adaptor: I needed an additional serial port on the laptop. One for the GPS and the other for Amateur Radio gear (Kenwood D700). You may want to check out the Pepwave CarFi instead of the SRC. Won’t work with Netstumbler, but it will re-broadcast wifi for use around your car. Sysadmn, I really don’t enjoy that kind of common sense to understand to know why the passenger side airbag needs to be disabled at all. This was a huge help trying to find worthwhile GPS devices. Thanks so much! Thanks for the article, its very very good to read. I am glad that I came across your blog! Now this is the setup I need! Its a nice guide.I am afraid if i can run these applications in my laptop…? You have provided with exceptional information. Thanx alot for this..